The Olympics have wrapped up, Canada's on a high and Brand Mojo has tens of thousands of ratings from hundreds of individuals. It's a good time to take stock and check out the world's most loved and hated brands- and Canada's most loved and hated brands. Below is some commentary on the data provided in the graph above. 1. Google is the run-away favorite for the most loved brand. It seems that the fun-sounding name "Google", exciting personality of the brand, and WOW factor of the products have found the right mix. (Think back to the "ohhhs and awwwwwes" the first time you checked out Google Earth.) To date it seems no one hates or even dislikes the brand (with the exception of Steve Balmer). How long will Google's magic work? It has set expectations very high. 2. Halliburton is the most hated brand. My assumption here is that the brand continues to be linked to allegations of corruption, unpopular Iraq war, and former President Bush. Incidentally, Bush takes the least loved spot in the "celebrity" category of Brand Mojo. Perhaps Halliburton's saving grace is the fact that it is not a consumer brand. If so many consumers hate the brand- and no consumer loves the brand- there simply wouldn't be any sales in the future. 3. 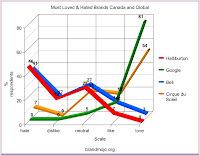 Cirque du Soleil is the most loved Canadian brand. It edged out Tim Horton's by a hair. What is interesting here is that Tim Horton's is heavily endowed with "Canadian heritage" while Cirque does not carry a strong Canadian endowment world-wide. I'd be curious to know what percentage of people attending the world-wide shows think that Cirque is from Canada. 4. Bell is the most hated Canadian brand. What surprises me here is not that there is animosity towards the brand, but rather how closely Bell's distribution of lovers and haters follows that of Halliburton's. (See chart above.) Here is a company ripe for a brand audit and brand recovery strategy. There is good news for Bell- its numbers have moved up slightly since its sponsorship of the Olympics. Of course, you can rate brands and check out the complete leaderboard at brandmojo.org..